I was reading last week Peter Scales’s chapter “The reflective teacher”… it was an enlightening read for me although by-nature I am doing a lot of self-observation, trying to recognise patterns and ways of improvement and development. The last two years or so, I have also been through my Chartership process in which reflection is the core element. It was very difficult for me to make sense of the process because I take for granted that Librarians should update themselves on a daily basis. If you want to be called an “Information professional”, you need to walk at the same pace as technology does and as the Information landscape evolves. This is my virtual notebook where I will collate all my reflective posts in a single document at the end of the process. I will try this week to post on a daily basis the bright moments experienced while reading Scales’s chapter and reflecting on my practice based on her guidance. Scales’s reading added new dimensions to the way I was reflecting so far. One of the things that impacted on my perceptions on reflection was Scales’s reference on Goleman’s theory on Emotional Intelligence (EQ). Goleman’s framework of Emotional Intelligence (EI) (2000) “reflects how an individual’s potential for mastering the skills of Self-Awareness, Self-Management, Social Awareness, and Relationship Management translates into on-the-job success.” Moore argues that if we include feelings in our reflection process, the latter will help us develop our Emotional Intelligence (IE), since Emotional competence is “a learned capability” that can be developed (Goleman, 2000). Do tips, tricks and techniques lead to job success? Do they help us become good teachers and good professionals in general? I would not think so. If tips, tricks and techniques were enough then so many professionals would be able to efficiently manage difficult situations based on the numerous workshops they attend on how to deal with difficult people, or difficult situations. While tips have their own place in our practice, they don’t help us to establish social or self-awareness, empathy or sympathy in order to be able to manage a challenging environment or connect with students. This entry was posted in #fslt12 and tagged #fslt12, Daniel Goleman, Emotional Intelligence, EQ, Jenny Moore, reflection, reflective practitioner, reflective teacher, research. Bookmark the permalink. 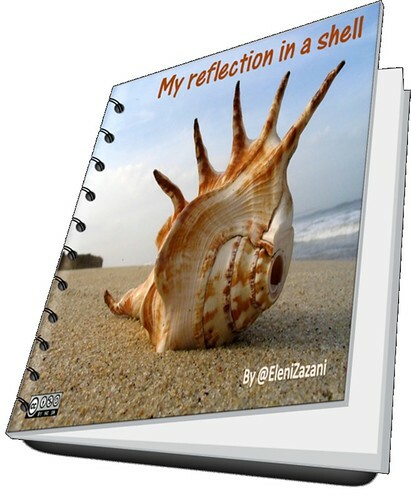 Hi Eleni – I love your image. Is that an ebook that you are going to collate? I’m interested in your comment about the tips, tricks and techniques for teaching success and whether we need them. In a past life I was a teacher trainer and before that a teacher in schools, so I think I have seen it from both sides. As a newly qualified teacher – I was like a sponge. I just soaked up anything and everything that I heard and the more tips and tricks I could get my hands on, the better I felt in the classroom. After all I was a novice teacher – learning to be a teacher – thinking only about ‘teaching’. But I gradually began to learn that it wasn’t really about me and my teaching – or any sort of teaching. It was all about learning and that’s what I should be focussing on. What was the learners’ experience. The when I was a teacher trainer, I saw all the trainee teachers doing exactly what I had done – thinking it was all about them and their performance – when it fact it was about what their learners were learning. So maybe the tips and tricks bit is a phase we all go through? Hi Jenny – Your comment put me into a lot of thinking. You are possibly right. I can see myself in a process of absorbing tips, tricks and techniques in order to make the content live and interesting for the students and also engage them in activities after a long day for them (and for me). The students I teach are all mature students, part-timers, attending classes during evenings. More than that, I am vulnerable not only in front of their eyes but also in front of their lecturers… I feel that I need to prove to them that it’s worthwhile to engage with the Information Literacy lessons and after all, it wasn’t a waste of giving out their lecturing time. So, tips, tricks and techniques is probably a phase until we reach a metacognitive phase and learn how to go with the “flow” with more self-confidence. Now thinking about that, I realise that Twitter discussions amongst educators are full of sharing tips, tricks and techniques through the lens of new Technologies … so probably this is again a starter’s phase of engaging with new technologies to facilitate learning. I don’t think that tips do not serve their purpose; on the contrary. What I was thinking about while writing about tips was that Librarians who teach do not actually feel like teachers and therefore stay a lot on the phase of the techniques. Luckily, in the UK, there is a major conference for Librarians who teach Information Literacy (LILAC), where we discuss our challenges and share experiences. During last LILAC, (April 2012) the issue of our teacher-identity came up and I realised that we need to spent more time for reflection and establishing a relation with the self, and also be engaged with communities of practice so that we empower our teaching Identity. I keep coming back to your comment and especially at the “learning experience” point. One of my main considerations is about creating opportunities for experimenting and hopefully learning. I came accross a situation (or more than one) where students knew which should be the proper academic practice and I could “assess” that they knew but then in their everyday practice they consciously refused to follow it, because it’s obviously easier to copy/paste rather than paste and attribute the source. They were also aware of the links between academic practice and its applications outside of the academic environment. The session was received by students as “a wake up call” but did it trasform their academic practice? is cognition enough to justify learning? I keep thinking what I should be doing differently but I find myself limited in influencing people’s attitudes when they don’t want to change it. I feel very dissapointed and I percieve this as a personal failure.